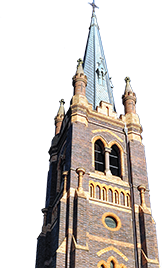 The foundation stone for St John’s Church was laid in the 1905 by Bishop O’Connor and the building was completed in 1906. The Parish Priest at that time was Fr J T Clancy who would probably have had his residence in Bingara. Fr John Collender came next and his assistant was Fr Condon who later, in 1918 was appointed first resident Parish Priest at Barraba. These priests used to travel to Barraba each fortnight using a buggy and a pair of ponies. Attached to the back of the old church building was a small room, furnished with a bed, dressing table, washstand and one chair. To the rear of this building was an open weather shed adjoining a closed shed for storing the vehicle and a small room in which chaff and harness etc was kept. In the period from 1913 until Fr Condon was appointed Parish Priest at Barraba in 1918, there were three other assistants to Fr Collender; Frs O’Reilly, O’Brien and Hynes. There being no presbytery, Fr Condon went to board at the Central Hotel, but the need for a private home for him soon became apparent, so the house adjoining the churchyard was purchased. This needed considerable renovation and had to be furnished. There were still monies owing for the building of the Church and Convent, so an intensive fundraising campaign got under way. Fr Condon gave his pair of taffy buggy ponies to be raffled (he must have acquired a care for his use) and people rushed to buy tickets. Other fundraising events included a dance and card party held in the Mechanic’s Institute Hall every Saturday night. These parties included four main stalls of sweets, refreshments, fancy goods, etc run by volunteers. During the thirties, an undesirable element had gained footing at the Saturday night parties, so the fund raising shifted to private homes. In the winter of 1931, one such party held in a small house (and in one of the bad years of the >Great Depression’) raised ^27.00 ($54.00). In early 1935, Fr Condon was appointed to Uralla and Fr Laurence Mahony, late school inspector, came to Barraba. Although by then the state of the economy was on the improve, Fr Mahony was appalled by the poverty and need for warm garments, etc he found in the Parish, following of five years of unemployment. In those days social benefits, otherwise >the dole’ consisted of food vouchers for no more than a few shillings worth of food per person per week. It was no doubt in this state of affairs that Fr Mahony urged that a branch of St Vincent de Paul Society was established in Barraba and received official recognition on 22nd July, 1943. During the war, Fr Mahony was widely referred to as “Dr Spencer’s Ambulance Driver” since with no ambulance then in Barraba, and sever petrol rationing for the average citizen, the good doctor made many an appeal to the Priest to assist in getting seriously ill country people into hospital. In 1946, Fr Norman Tuttle came to Barraba. During the years of the depression, followed by 6 years of war the Parish property had become sorely in need of repair and maintenance, especially the presbytery. Also the Church itself needed to be extended. This extension was completed and blessed in 1950. Sometime previous to this a house on the eastern side of the Presbytery had been purchased. This together with the Presbytery were pulled down and the iron and timber from them used to build temporary accommodation for Fr Tuttle and his housekeeper. This building later became known as ‘the Shack’ and was used for ‘Housie’ games and also to house St Vincent de Paul collections of clothes. The new Presbytery was built across the double frontage into Savoy Street. Following Fr Tuttle was Fr Leahy and then Fr Maron as Parish Priests. Late in 1960 Fr Conroy came to Barraba from Bundarra. Fr Conroy’s health was not the best in the earlier part of the 1970s and late in 1973 he became seriously ill. After a time in Tamworth Hospital, he went to Nazareth House for convalescence with the hope of returning to Barraba. A Fr O’Brien was appointed to serve the Parish pending the return of Fr Conroy but it soon became apparent that he would not again be well enough to resume the care and work of the Parish. Towards the end of 1974, Fr Conroy resigned and Fr Foley was appointed to the Parish. During Fr O’Brien’s stay, he had the interior of the Church painted, the side alters and statues removed and commenced offering Holy Mass facing the congregation in conformity with other churches in the Diocese. Fr Foley arrived late in 1974 and remained until late in 1981. Fr Hanna relieved for few weeks pending the arrival of Fr Shanahan in January 1982. No further information has been provided at this stage. Please forward any information to the Catholic Schools Office (Attention: History Website) or post to P O Box 636, ARMIDALE NSW 2350.